Deputy First Minister and Scottish Labour leader clashed on the pound, the EU and Trident. The two most senior women in Scottish politics have gone head-to-head in a heated debate on independence. Deputy First Minister Nicola Sturgeon and Scottish Labour leader Johann Lamont clashed on issues including currency, the European Union, the nuclear deterrent and the future of devolution. 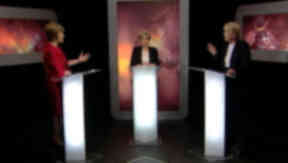 The exchanges were at times angry, with both politicians shouting over one another during the cross-examination section of the debate. The Scotland Tonight special programme was presented by Rona Dougall, who began by asking both women what the Yes and No campaigns had to do to win over female voters. Ms Sturgeon said: "I think we've got to persuade women, men, everyone who will vote in the referendum that voting yes, voting to put Scotland in charge of our own future, is better not just for our futures but for the futures of our children and grandchildren. "We suffer greatly from having governments that we don't vote for. Right now we have a Westminster government led by the Conservatives that lost the election in Scotland, imposing welfare cuts that will push tens of thousands of more children into poverty. "I don't think that's a price worth paying for Westminster government. I think people thinking about the future will want to take control of economic policy so we can grow our economy faster and take control of social policy so we can create a fairer Scotland, a Scotland where everybody has a fair chance to get on and succeed." Ms Lamont said of women voters: "First of all we don't patronise them by finding a package of things that we imagine somehow unique to women. I think it's quite a difficult question to answer why women seem more reluctant to support yes. "I think it's a healthy scepticism and we're keen to make sure the evidence is there. It's not enough simply to assert the world will be better, we need to know there is a degree of certainty, security, and I think the test for whoever is promoting the idea of Scotland separating from the rest of the United Kingdom is to be able to answer those questions: what is going to happen in the economy, what is going to happen with our pensions? "It's not enough to say we will do fabulous things. We have to know how those will be paid for." The debate moved on to the question of currency. It came one week after the three main UK parties ruled out a currency union with an independent Scotland. Conservative Chancellor George Osborne, Labour shadow chancellor Ed Balls, and Liberal Democrat Chief Secretary to the Treasury Danny Alexander all indicated any future government led by their respective parties would not agree to enter a sterlingzone with an independent Scotland. The Deputy First Minister was asked whether the Yes side could provide voters with certainty on the pound, given the stance of the UK parties. Ms Sturgeon said: "I think people are sensible and intelligent, and people can look at the position of George Osborne backed up by his pals in the Labour Party and recognise campaign tactics when they see them. George Osborne, Ed Balls want Scotland to vote no. That's legitimate. What is not legitimate is ganging up to try to bully and intimidate Scotland on the issue of the pound. "The reason they will change their position in the event of a democratic vote for independence is that it would be completely against the interest of the rest of the UK. Transaction costs for English businesses, putting the trade deficit up and risking the potential of being left with the entirety of UK debt. "These are the commonsense reasons why a currency union doesn't just make sense but will happen in the event of independence." However, Ms Lamont rejected her opponent's argument and said the Chancellor and other UK politicians should be taken at their word when they say they oppose a currency pact. She said: "I think the most revealing thing about the reaction of Nicola Sturgeon and others to the announcement by George Osborne, Ed Balls and others that they wouldn't support a currency union was that she presumed they must be lying. "I think that says more about the view of the SNP... Your defence is that George Osborne is going to change his mind. What I'm saying is, we need to understand when people say no, we should work on the basis that they're telling the truth." Ms Sturgeon was also grilled on whether the remit of the Scottish Government's Fiscal Commission Working Group included the power to recommend a "Plan B" on currency, as well as whether Scotland would face difficulty in applying for membership of the European Union. When it came Ms Lamont's time to come under the spotlight, she was quizzed on welfare policy, devolution, and the consequences of a No vote in September. She also came under pressure on the question of Trident, the UK's nuclear deterrent which is based at Faslane on the Clyde. It was put to her that the only way Scots could scrap Trident was by voting Yes in the referendum. But Ms Lamont challenged the premise, saying: "I think the issue about Trident is a much bigger issue. I think there are people right across the world who recognise the danger of nuclear weapons and seek a more peaceful world. But it does seem to me a contradiction that on the one hand the SNP said it will get rid of Trident; however, they fought tooth and nail with their own membership to ensure that Scotland would seek membership with NATO, which of course is a nuclear club. Everybody knows that. There seems to me to be a contradiction there." She added: "You would get rid of Trident in my view when you win the political argument... This is a much bigger issue than political parties: People who want the world to be a safer place, how do we defend ourselves, how do we not create those kinds of risks. That is beyond party. I know there are people who will be supporting independence on the issue of Trident but I also know there are people right across the world who want to work in cooperation to reduce the number of nuclear weapons there are." The Scottish Labour leader confirmed she had "grave reservations" about the renewal of Trident. The SNP deputy leader hit back, saying: "It's a moral case and principle: you're either for or against nuclear weapons. You can't have it both ways." The moderated debate was followed by a cross-examination section in which the two politicians got the opportunity to pose questions to each other for ten minutes a piece. The exchanges were often sharp and hostile. Ms Sturgeon questioned the Scottish Labour leader on what new powers Scotland would gain in the event of a No vote. When it came her turn, Ms Lamont pressed the Deputy First Minister on shipbuilding jobs. Following the debate, STV's political editor Bernard Ponsonby and Radio Clyde and Radio Forth's political editor Colin Mackay offered expert analysis of how the debate had panned out. Mr Ponsonby felt the shouting and angry exchanges may have satisfied committed Yes and No voters but would have had a potentially rebarbative effect on undecided voters looking for reasoned arguments and information. Mr Mackay praised Ms Lamont's debating skills but concluded that, once again, Ms Sturgeon had bested her opponent.